I have neglected my blog lately due to so much goings on here in the design studio. I have been a busy little bee designing a new line of hand dyed fabrics that I have turned into the new "Seaside" line of pouches. The colors consist of "Mediterranean Mist", "Pink Coral", and "Sea Foam Green". Can't you just feel the sea spay on your face as you read this. The new line was inspired by the cool crisp salty waters of the Mediterranean ocean. The fabrics are complimented by crisp white leather ( which is a new addition to my product line) and a metal zipper closure with a long white leather zipper pull accented with natural seashells. 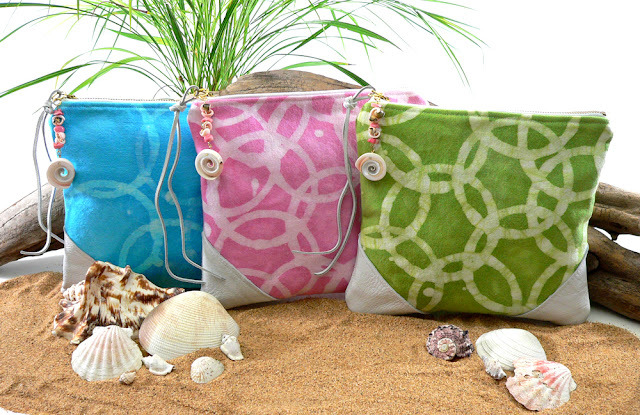 The new "Seaside" pouch line will be in my store very soon. They will be a made to order item.